INTRODUCING GSI TENNIS JUNIOR NIGHT CAMP FOR ALL LEVELS AND AGES. ​Inspired by the intense Florida summer heat, GSI Tennis has decided to schedule this summer's tennis camp in the early evening from 5 to 7 pm that will focus on tennis only. Although it is still quite hot, it is much more tolerable in the early evening as oppose to the heat of the day, so that players can hone in on developing their tennis skills and enjoy the game more. As a segue to our GSI Tennis After School Program which ends on June 1st and begins again on August 20th, GSI will offer this special Tennis Camp from June 11th to June 29th and July 9th to August 3rd, Monday through Friday from 5 to 7 pm. 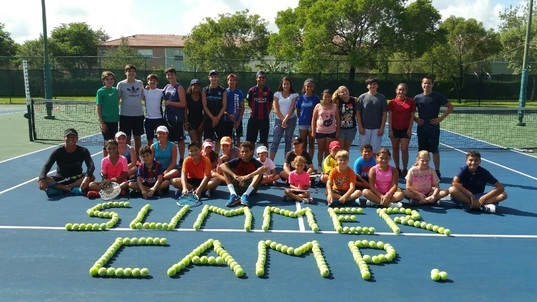 The camp will offer 3 different levels, (1) Future Stars and Pee Wees (beginners and intermediate ages 7 to 10), (2) Jr. Academy (beginners and Intermediate ages 9 to 14) and (3) Academy (Intermediate and Advanced 10 to 18) Note: Academy students will also attend 2 USTA tournaments during the summer camp accompanied by Coach Tom and coaching assistants. Identical to our After School Program, the Future Stars and Pee Wees will be focus on developing fundamental tennis strokes by using games to keep learning fun. The Jr. Academy's focus is on preparing the students to able to play matches and games with each other as oppose to only hitting balls from coaches feeding them. The Academy program introduces the student to USTA tournaments which is the quintessential tennis competition event in the US. This program is idea for those who aspire to playing the game of tennis at it's highest levels.